The solids that remain in the sieve: yes you can pickle in apple cider vinegar for a soft, traditional British style pickle, or you can grate in a salad. Or add to soups. Or re-ferment, doing all of the above, again. I have even used these semi-tired beetroot shreds to make vinegar, by adding a little sugar and water and inviting the alcohol that develops to morph into a wild vinegar, as discussed earlier in this blog. The vinegar that’s resulted has been a beautiful ingredient to deglaze pans of sautéed bitter greens, and also in soups. And Borscht. So very much to say. My mother taught me to make a recipe I now look at askance– lots of vegetables like carrots, onions, beetroot, so it would be that gorgeous purple, but soured with vinegar not by fermentation…. Some people make very beety soups, pureed or not, and call them borscht. I don’t know what technically defines the category of soup referred by this name, but I would not personally consider a soup to be one if it were not sour, and to me it’s more of one if it’s soured with fermented beets. So I would now always use my “kvass” as the souring agent at the end— maybe it would begin with chicken or beef stock, or veg stock, have many vegetables including cabbage, and maybe even sauerkraut, but be finished with chopped or shredded beets. Hot and sour is a very bright and healing combination for soup. Cold and sour too. I’ve seen versions bright pepto-bismol pink with cream or sour cream, and sometimes chopped hard-boiled eggs. Potatoes are welcome, and carrots. I like adding the beet greens too. There’s a huge range of soups across Eastern European traditions. It would be a fun anthropological exercise to collect and categorise all that variation and diversity. I have a wonderful 1956 cookbook which I treasure: Love and Knishes: An Irrepressible Guide to Jewish Cooking, by Sara Kasdan. It was 20pence at a charity shop! (I am proud to say that I edited the Wikipedia entry on the illustrator Louis Slobodkin to include mention of his drawings which are charming, light-weight line drawings of big breasted women cooking and serving steaming portions to skinny men.) Kasdan writes about “Russel,” or “sour beet juice” which is basically beetroots fermented in water for four weeks to become the basis of a soup. I knew a Polish person who described this same method, with a hunk of sourdough bread and garlic– all variations of what we are nowadays as fermenters talking about as Kvass. Since writing the piece linked above, I’ve made so many bottles of this beetroot kvass, with various spices (favourite: cloves and ginger and maybe orange peel) — and poured it in so many soups, I still believe in this idea of a continuum between the tonic, health giving beverage, as Kvass has come to be thought about, and the soup. I’ve also become intensely interested in the idea and practice of the sour soup, which I will write about on this blog some day soonish. 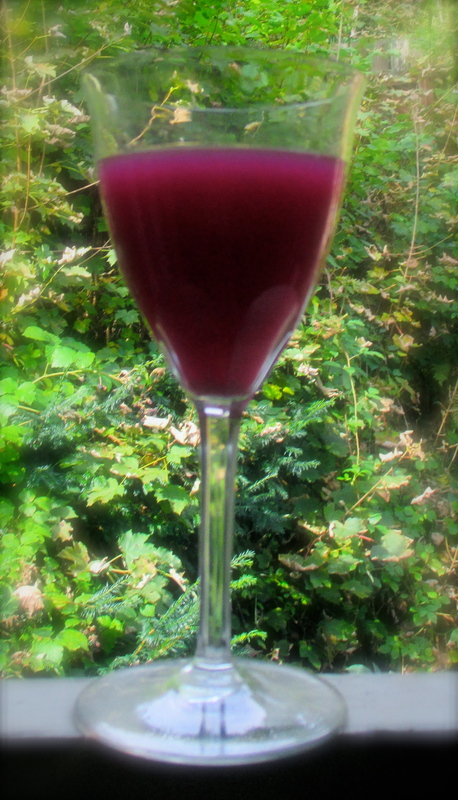 No colour is more alluring than these purply pinks that one gets from various intensities of beet-in-water. Elixer conjures a magic I still stand by. Brilliant Annie! I’ve been trying to get your email and blog address. We met at the workshop you did 2-3 weeks ago at Newbridge on wye. I really enjoyed it and we’re making bread everyday from your sour dough culture!